The Indian Premier League, the most-celebrated IPL is back with a bang! As the nation, dynamic teams, and our favourite players, gear up to engage us in their alluring game, we at Falak are all set to host you IPL-maniacs! The opening match will be the highlight, and other matches will be also screened live at Falak. 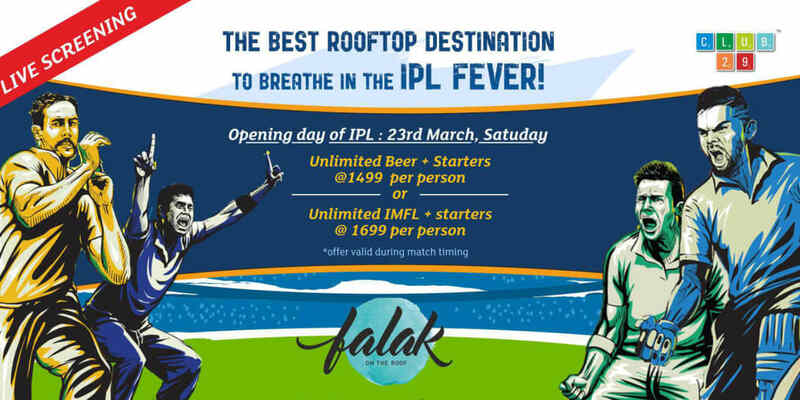 What better destination to watch an IPL match than enjoy it with some drinks at a rooftop restaurant? Watch the first match with all your friends-circle and get ready to roar, cheer, and shout, for the rest of the IPL Season! Live screening of the opening match | 23rd March, 2019 | 8.00 pm | Chennai Super Kings v/s Royal Challengers Bangalore.